Thrown off, I could only think Where’s my phone? (in my purse) followed quickly by Where’s my purse? (on the other side of the room) followed quickly by How do I navigate this sea of children to reach it? (very carefully in my size 10 feet) ---before an on-the-ball teacher deftly circulated George Rodrigue’s photograph from her iPad. 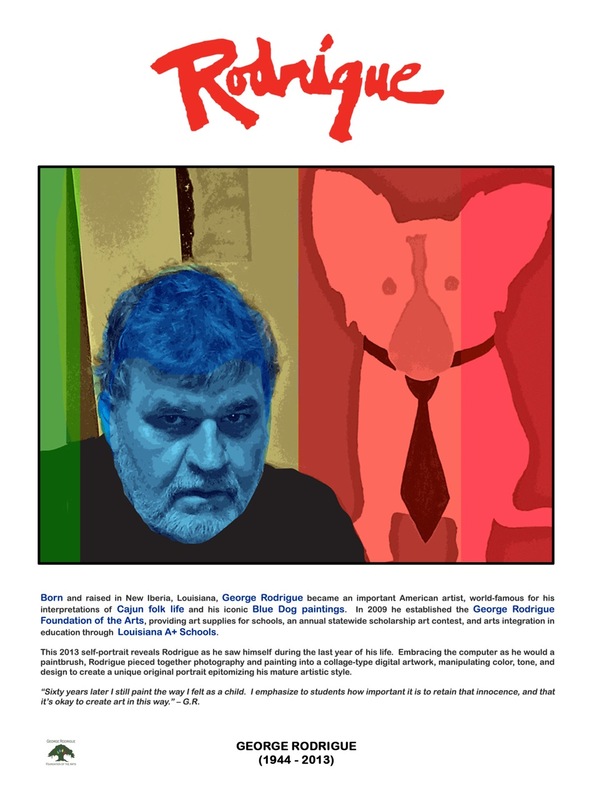 This simple scenario haunts me, because George’s face and voice and mannerisms are imprinted in me so strongly that I near-panicked at the thought that others don’t know, or worse, won’t know the Blue Dog Man. 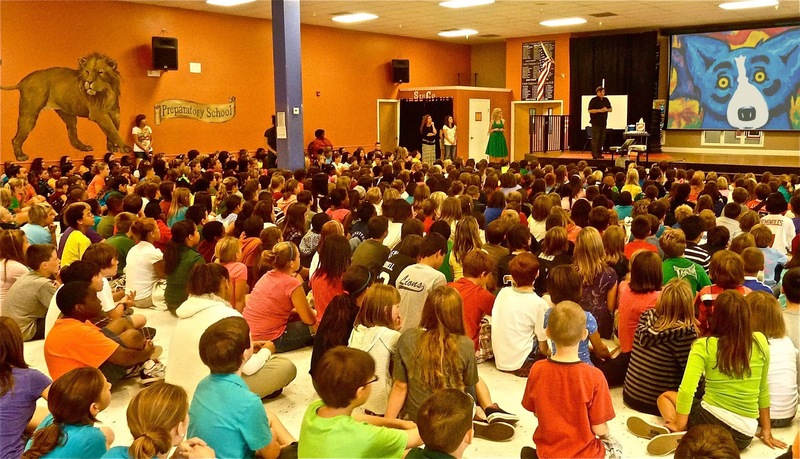 "GRFA advocates the importance of the arts in the development of our youth. We encourage the use of art within all curriculums and support a variety of art educational programs." I envisioned a plan. As has happened repeatedly since George passed away, I find that whatever the needs are for his art, he has already provided the answer. That was the case with the I VOTED sticker, the Rosemary Beach Sculpture Exhibition, and most recently the Hurricane Harvey relief prints. What better way to answer What did he look like? than with George's own artistic interpretation! To distribute these special artworks, to be hung prominently within each Louisiana A+ School, I enlisted the help of LAA+ Executive Director Bethany France. Over the years, George and I visited hundreds of schools together, engaging with students through art demonstrations and discussions. It took time for me to re-envision these experiences without him. 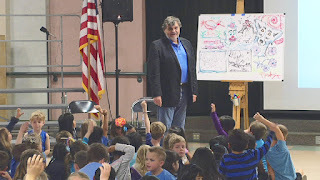 In 2013, following our last school visit together, George observed…. 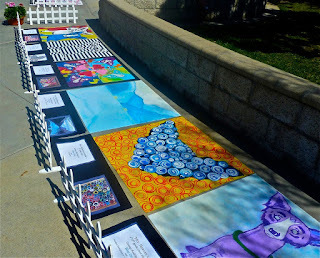 "It's the kids who bridge the art. To be studied by a child is the best way to connect with the future and is more important than hanging on the walls with the great masters. It took a grammar school teacher and students to help me see this perspective, and it gave both me and Wendy a completely different view and impact, and maybe even a new beginning." For this Fall 2017 statewide tour of eighteen LAA+ Schools, Bethany France helped me formulate a plan, complete with an unveiling of George’s portrait, along with classroom visits with as many children as possible. Most special, I share original Rodrigue paintings from our home ---a refreshing alternative to reproductions and power points--- and in many cases the first original Rodrigue artwork the students have ever seen. "The donation of these beautiful prints supports the growth of arts-integrated learning throughout Louisiana,” explains Bethany France. 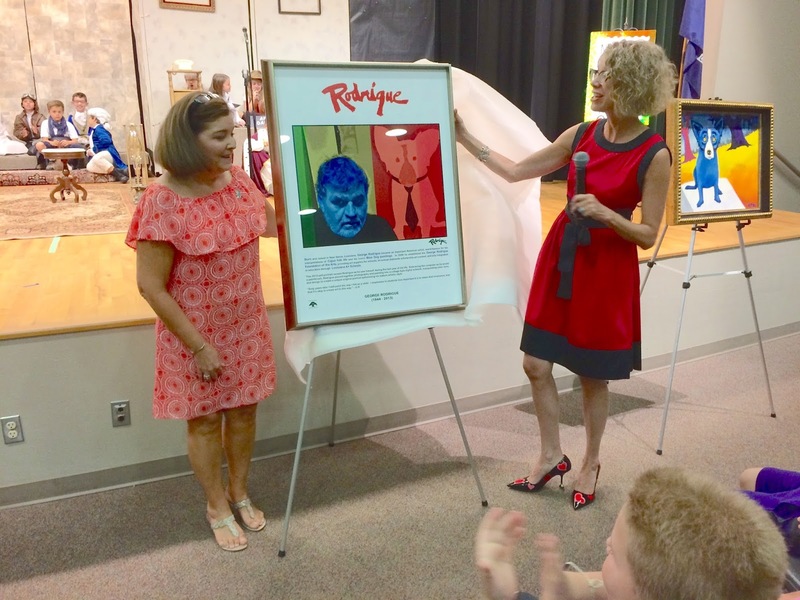 “I believe that Mr. George Rodrigue would be very proud of the commitment to innovative learning and the importance of implementing the arts into every aspect of the classroom as demonstrated in Louisiana A+ Schools." Touring Louisiana A+ Schools is a natural for me to further honor George. 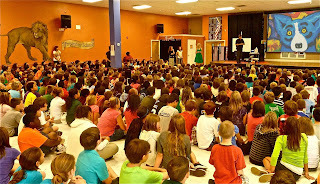 He believed, as do I, in arts integration in all aspects of life ---especially education--- which is why the George Rodrigue Foundation of the Arts has supported LAA+ Schools from its inception. I’m now two weeks into this ten-week tour and am witness to exciting and creative academic lessons shaped by the visual and performing arts. Students, teachers, and administrators are both inspired and inspiring, in an environment where school participation is motivated by a real passion and joy for teaching and learning! Admittedly, I began this tour feeling bittersweet. However, that has shifted to elation, as I see students and teachers come to know George in a personal, meaningful, and memorable way. I'm truly enjoying this tour and am grateful to the schools for allowing me to share with them. It is my life's work, since 1991, to educate others ---through exhibitions, lectures, school visits, and writing--- about the life and art of George Rodrigue. Furthermore, it is in large part because of George's efforts that the arts are a daily and integral part of the educational experience at the Louisiana A+ Schools; and it is imperative that every student recognizes not only his art and name, but also his kind and beautiful face. Gotta run..... Can't be late for school! Even now, even with George's art, it is impossible to capture what George looked like. He was such a big man, so much more gentle than his vibrant colors-on-canvas, with eyes that telegraphed that he knew he was going to make you laugh as soon as he could. George was a piece of art, and always, in great measure, Wendy helped craft him. He wasn't hard on the eyes, either. Oh dear Patty, beautiful words as always. Thank you!